Celtic mythology, suspense, and a modern day romance! Xander spent most of his life exploring his mother’s disappearance. When new clues surface that suggest she’s alive and waiting for him to find her, he must decide what he’s willing to risk to get his answers. Tressa longs to accept Xander’s proposal of marriage, but as evil fae surface around every corner, she must choose between putting him in constant danger—or letting her soul mate go. Tressa and Xander want a peaceful life together, but will their destiny make it impossible? As the King’s Jewel, Tressa is destined to save her people—but at what cost? When the Sword of Light brings out Xander’s violent side—can he break the hold it has on him? 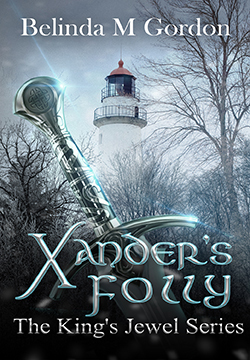 Xander’s Folly is the second book in the King’s Jewel fantasy series that blends Celtic mythology with a modern story. If you like drama, romance, and plots with twists and turns…Buy Xander’s Folly today!